Macey, A.I., Ryan-Keogh T J, Richier, S., Moore, C.M., Bibby, T.S. Iron availability influences phytoplankton physiology and growth over more than one-third of the surface oceans, with recent evidence even indicating iron stress during and following the latter stages of the spring bloom in the high latitude North Atlantic. The mechanistic basis of the phytoplankton physiological responses used for diagnosing iron stress and the broader ecophysiological consequences of iron stress within natural phytoplankton communities still remain unclear. We describe photosynthetic macromolecular and physiological responses of natural phytoplankton communities both in situ and within factorial nutrient-addition (iron and nitrogen) experiments over a seasonal growth cycle in the subpolar North Atlantic. The abundance of quantified photosynthetic proteins increased under relief of iron stress, with the synthesis of the associated protein catalytic complexes accounting for, ~ 3% of inorganic nitrogen drawdown. However, no significant differences in the stoichiometries of the photosynthetic complexes were observed, suggesting that re-modeling of the photosynthetic electron transport chain was not a significant influence on the community-level ecophysiological responses to iron stress. In marked contrast, iron stress resulted in significant increases in the cellular ratios of chlorophyll to the photosynthetic catalysts, including photosystem II (PSII), alongside a marked increase in PSII normalized chlorophyll fluorescence. Characteristic depressions in apparent photosynthetic energy conversion efficiencies in iron-limited oceanic regions are thus likely driven by a significant accumulation of partially energetically uncoupled chlorophyll-binding complexes. Such iron-stress–induced chlorophyll-binding proteins may contribute, ~ 40% of the total chlorophyll pool during iron-stressed periods. Incubation Experiment 4 (IE4) is shown as a typical example of the response of the phytoplankton community to the addition of Fe (white symbols) in relation to control samples (black symbols). (a–c) changes in the apparent photochemistry of PSII (Fv : Fm), chlorophyll a (μg L-1), and nitrate concentrations (μmol L-1). 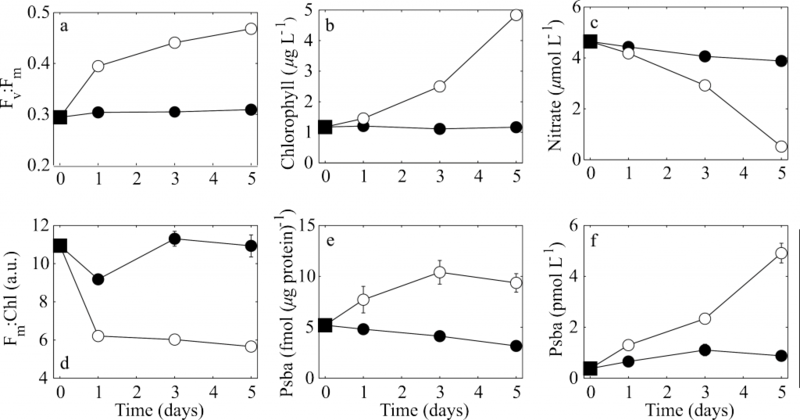 (d–f) changes in Fm normalized to chlorophyll (Fm : Chl), and accumulation of the peptide PsbA (a subunit of the photosynthetic complex PSII) normalized to total protein (fmol (μg protein)-1) and as total molar concentration (pmol L-1). a.u., arbitrary units.